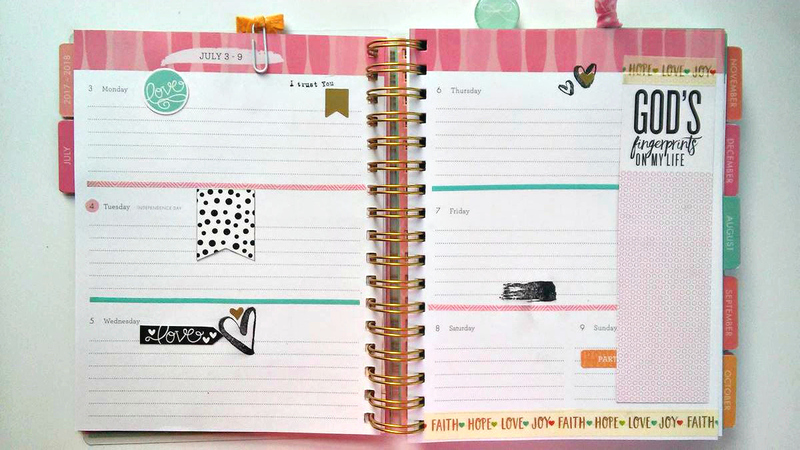 Where are all my planner friends? I know there’s a lot of you! Today I am sharing something I’m a bit obsessed with lately… I am giving an inside look at my new DaySpring 18 Month Planner and showing you how I am planning on using it for the upcoming month. This is an 18 month planner and I have some tips to help you decorate and organize your planner! You may have seen that DaySpring and Illustrated Faith just came out with 5 new planners that you can use to document your faith, doodle in, or just use at your day planner. They start this July and will go through the whole of next year. I am loving this planner and having so much fun with it. I appreciate how sturdy it is, from the coils to the laminated covers and even the heavy paper. This is a planner I have no problem tossing in my bag! DaySpring did send me this planner to review for you, but all opinions are my own. Affiliate links may be used, which gives me a small commission when clicked….I appreciate the support! I mentioned before that his planner can definitely be used as a memory journal or praise book to document different seasons of your life. I am using it for a day planner, but I will also be documenting prayers or scripture I want to memorize. You’ll be able to see more in the video below. I also show you in the video a few of my favorite supplies to use in my planner and different ways that you can use them as well. You will find monthly views, weekly views, year at a glance, list of holidays, notes section, pages of stickers, a folder insert, and so much more. Check out my video below to see how I am going to document my faith as well as use this for my everyday planner. I’m going to walk you through the whole planner so you can see all the details. My kids did decide to get loud a few times, so you’ll have to excuse that! Here is my weekly spread…so much space to write in and decorate for the week! Don’t forget to watch the video to you can see everything inside and then let me know if you have any other ideas on how you best use and customize your planner…I would love to know! GO ON OVER AND BE SURE TO HIT “SUBSCRIBE” TO MY YOUTUBE CHANNEL SO YOU CAN BE NOTIFIED OF ALL MY VIDEOS! Your planner is so perfect and pretty! I just made a trip to Target last week and bought TONS of planner essentials in the dollar section and I can’t wait to get started on decorating and organizing it. After seeing yours, I definitely have a lot of work to do! I watched your video last night! Beautiful planner and I’m now motivated to make sure I’m using mine more. This is just awesome! I love that you added a video too! I love the video! You have a beautiful planner! I love this post! Having a planner is so important for me so thanks for sharing some of your tips! These planners are so fun! I love the video too! I”m obsessed with clean and beautiful journals. the type A in me is always making lists upon lists upon lists. I loved your video clip, inspiring me to get back to my organized ways! I’ve started to let them slack this summer. Whoops! What a cute planner! I am a super planner/to-do list person, helps me stay organized. LOVE that planner! I need to get one! Being organized in my day to day keeps me sane! 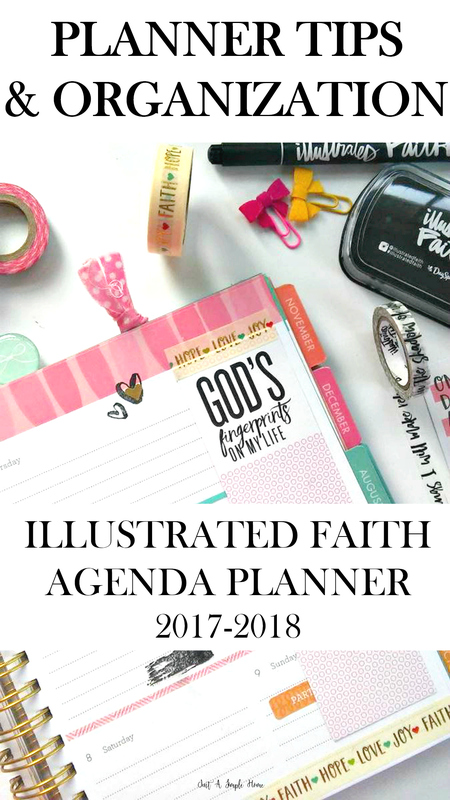 What a great way to use your planner – I never thought of incorporating a planner into my faith or daily prayer. Yours is so colorful too! This is such a pretty planner! I love this, I just recently bought a planner to help me get more organized with my blogging, but I love with this one how you can personalize it a little more and use the extra space for scripture! These planners are so beautiful! I love how they are full of scripture and they are so vibrant! Such a beautiful, colorful planner! Thanks for the tips and how-to! Such a beautiful planner! I’m thinking of switching planners. I already use the Mormon Mom Planner, but with exchange and shipping I’m looking for another alternative. I love planners and they have to be pretty so this is a win, win! This a great video! So beautiful! Just bought a Dayspring planner! Love it! I’m a sucker for a paper planer. My hubby insists on electronic but there is something about paper and pen that eases me. I really like the features of this one, plus it’s pretty. That looks like such a nice planner. I wish I had entered your giveaway a while back. They are really nice! Ohmigosh, I’m such a planner nerd and I LOVE this one! It looks like a new planner may be in my future! So pretty!!! Love the video as well! 🙂 Now you’ve made me want to get better at using my planners (I have a personal one, and a blog one). Love the video! Now I need to go and buy one of these planners. It is beautiful! Love this! I love my planner and notebook. I depend on my little notes and lists a lot I realize! Love how organized and beautiful yours is!